Dyslexia is pretty common and affects almost 10% of the world population. More than 70% of the kids who are not diagnosed with dyslexia until 2nd grade, carry it till their adulthood. It is very important that you know if you are dyslexic or if your kid is dyslexic so that it can be treated. If you ever asked yourself “Am I Dusylexic“, or “Is My Kid Dyslexic?”, then you need to take a dyslexic test soon. These best online dyslexia test for adults and kids will help you out with the same. Some of these tests are dyslexia test for adults, while some are dyslexia test for children. Some of these also provide a test for both adults and kids. Let us get to know about these tests one at a time, and see what they have in store. Know If You Have ADHD With These Online Tests. 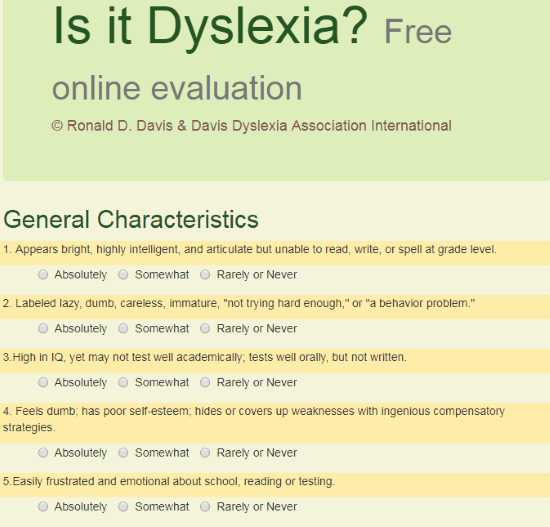 An exclusive website for dyslexia assessment: Is It Dyslexia? You can use it to check dyslexia for self or for others. It is suitable for both adults and children. There are various sections in this test which have questions related to hearing, writing, reading, memory, time management, behavior, personality, health, etc. There are a total of 41 questions, and you can even leave a question if it doesn’t apply. The result page shows an extensive report. It talks about the strong and weak areas of the person, and also tells if the person might be suffering from dyslexia. 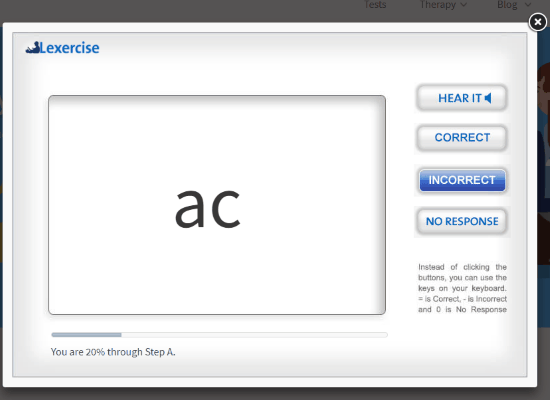 Dyslexia Test from Lexercise is an interactive online dyslexia test for children. The test module shows alphabets arranged in random ways which may or may not mean anything. The test begins with 2 alphabets arranged and the number of alphabets increases as the test proceeds. For each arrangement, you have to ask the children to try to spell the alphabet arrangement. You can listen to the correct pronunciation and click on the appropriate button according to the children’s response. At the end of the test, you will get the result which tells if the kid may be dyslexic or not. Try out this test here. 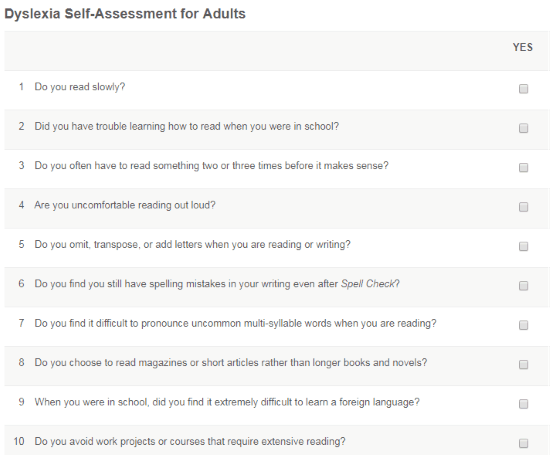 Dyslexia Self-Assessment for Adults from International Dyslexia Association is basically a checklist. As the name suggests, it can only be used for adults for self-assessment. Here, you will find 10 questions related to dyslexia. Check the Yes mark after a question if it is true about you. At the end of the questions, if you have selected 7 or more questions, then there are good chances of you being dyslexic. 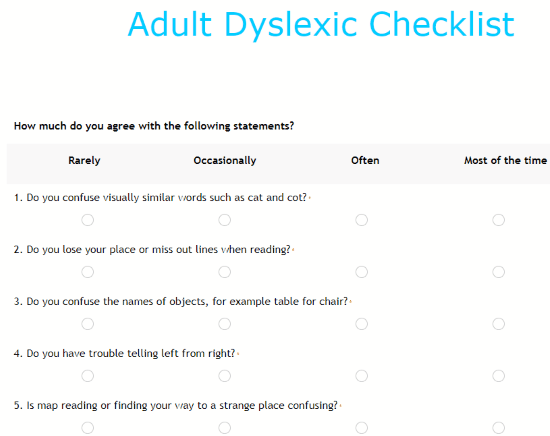 Adult Dyslexic Checklist is again an online dyslexia test for adults. It has 16 questions that are divided into 2 parts. The first part asks how often you make certain mistakes. The second part asks questions about how challenging are certain things for you. At the end of the test, you get a test score. To understand what your score means, you will have to enter your email ID, and the report will be sent to you. 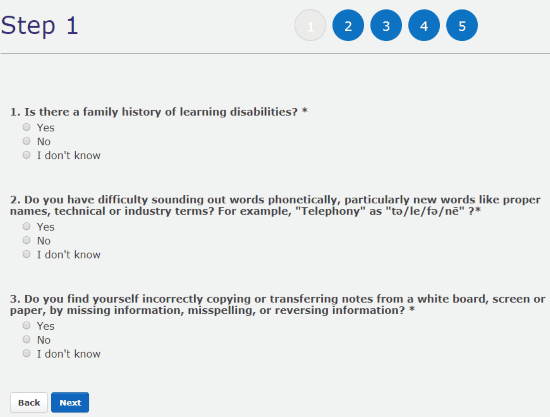 Dyslexia Test from Learning Ally has dyslexia test for children and dyslexia test for adults. The first step is to select the type of test, then it asks questions accordingly. Then it asks you several questions regarding reading, writing, pronouncing words, etc. To get the result, you will have to provide your name, and your email ID to receive it in your inbox. the result shows if you may have dyslexia or not. You can choose any of these tests to know if you or your child may have dyslexia. Although the results are not accurate, but give you a rough idea and are reliable.